The original Sun Mar Mobile 12V DC is for mobile applications like boats and recreational vehicles. This self contained compact composting toilet means the end of expensive pump outs, changing containers and pouring out urine. Like all Sun Mar range the Sun Mar Mobile features the patented Bio-Drum that allows the rotation of compost in the toilet. Every two days when the toilet is in use roll the drum 4-6 revolutions. Once a month or so roll the drum anticlockwise to drop some compost into the finishing drawer where is remains for at least another month to break down. This method means that you never have to handle any unbroken down waste. If the toilet is not in use the drum does not need to be rotated. Sun-Mar’s mobile composting toilet is the tried and tested three-chamber system but the marine toilet needed some modifications in to “marinize” it. The need to be able to handle violent motion meant that the finishing drawer had to be gasketed so that no liquid could escape from the evaporating chamber. The air intakes faced the same problem. These had to be located higher up and the air ducted down to the evaporating chamber. 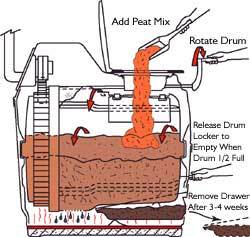 At the same time, a special drum locker ensures that the composting drum is held upright under all sea or road conditions. Space constraints mean that a fold-away foot rest is needed on the marine toilet. This footrest has spring loaded legs, and a safety release mechanism to enable it to be removed easily when access to the finishing drawer is required. Also, strong mounting brackets are provided for the base and rear of the unit. 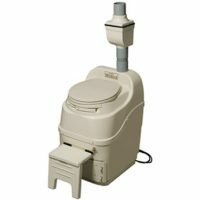 Electrically, the Sun-Mar marine toilet is quite different from other Sun Mar composting toilets. A 4.0 Watt 12 Volt fan is installed in a fan box within the vent stack. This fan, (which is on its own circuit) is designed to operate continuously while the unit is in use. To assist the 12 Volt fan in providing adequate venting, the Sun-Mar Marne toilet is unique among Sun-Mar units in having a 3″ vent stack (other units are 2″). Customers need to supply their own deck vents, which should be constructed to allow adequate air movement while preventing seawater from entering the unit. While venting is optimal above deck level, some installations will require that the deck vent is flush with the deck. Sun-Mar has incorporated the use of activated carbon and zeolite filter materials in the fan box to “scrub” the air of fresh ammonia odors. This has proven successful, and ensure odor-free operation at deck level. Evaporation is aided by a 12V (120 Watt) heater and thermostat. This heater is located in the sealed base compartment. 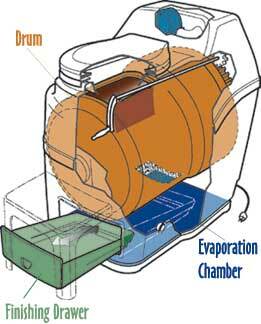 Evaporation capacity on Sun-Mar marine toilet is limited by the size of the heater, the surface area of the evaporation chamber, and the volume of air movement. Consequently, arrangements should be made to connect the Sun-Mar Mobile drains to a container or small holding tank for disposal in an approved manner.